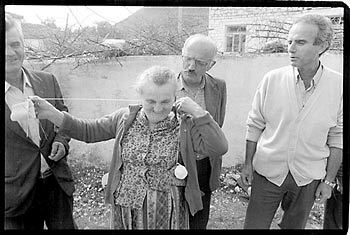 Unlike Vlora, where political persecution followed me at every step, Shen Vasil was a place where I always found sympathy. As soon as Martha and I entered the village of my father’s birth, old men, women and children gathered around us. As for the young people, they have left, most of them to Greece, where there is work and better pay. Vito, my father’s cousin, tried to hide her knitting in front of the camera so that she would look better, but this is exactly the sort of photograph Martha likes to shoot. 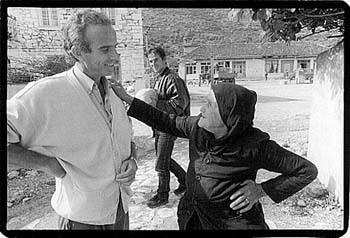 Ulia, an aged village woman, always impressed me with her religious dreams of Saint Spiridon and Saint George, which prophesied a dark future.